Upworthy, an aggregation web site best known for making warm and fuzzy stories go viral, has a new plan: "quality empathetic storytelling." What does that mean? It means doing original reporting and interviewing and appealing to users' emotions to generate huge amounts of traffic. "We are moving from curation to story creation," Upworthy editorial director Amy O'Leary said in a manifesto of sorts that was published on Wednesday. The web site pointed to a recent example titled "5 incredibly delicious chain restaurants you should never, ever eat at and 1 you should but can't." True to the site's progressive slant, it urged readers, "Don't eat at Papa John's" due to the company founder's highly critical view of Obamacare. It also expressed opposition to several other fast food chains for other political reasons. O'Leary described the 5,000 word story this way: "Upworthy writer Eric March used a set of strategic techniques (humor, surprise, and structure) to engage over 2 million people on subjects of wage fairness and justice." Upworthy is essentially saying that it wants to apply its highly clickable (some would say manipulative) headline style to storytelling. O'Leary and the site's other leaders are emphasizing the use of data to have a sense of what stories will work best. O'Leary summarized the plan this way: "We believe that high-quality, mission-driven, data-informed storytelling that works with platforms, not against them, is a truly exciting and defensible new frontier." 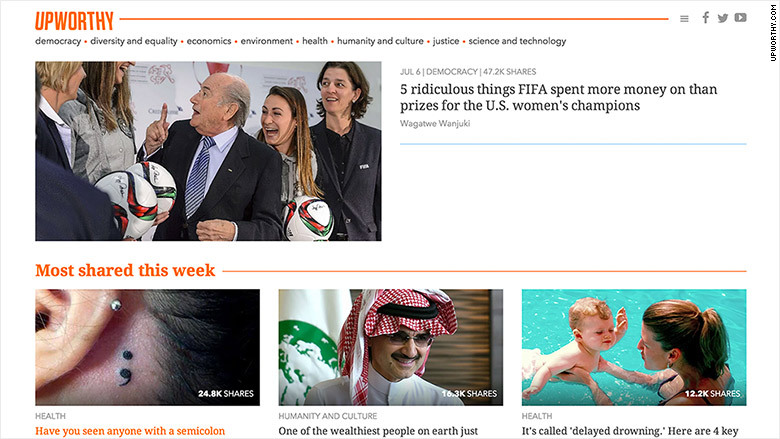 Upworthy's shift toward original content, and away from aggregation, was first reported last month by Capital New York. It was telegraphed back in February when O'Leary, a former editor at The New York Times, joined the startup in the new position of editorial director. What initially worked for Upworthy -- headlines like "They Thought It Couldn't Happen To Them. And Then It Did" -- were quickly copied by other web sites. The new idea is that original stories and videos will be harder to copy.